The entire text of Property Rights in the Defence of Nature is available online for free. Click on the book cover to access the text. 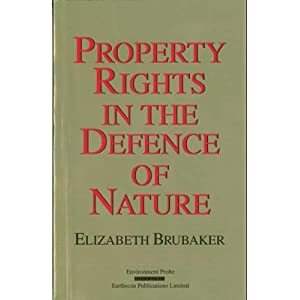 This entry was posted in Property Rights, Reports, Studies, and Books on Property Rights, Reports, Studies, Books and tagged American environment, British environment, Canadian environmentalism, Candian environment, common law, common law property rights, common law rights, Elizabeth Brubaker, expropriation, private nuisance cases, property rights, Property Rights in the Defence of Nature, riparian rights by Environment Probe. Bookmark the permalink.